We know protection and performance like it's our job. Because it is. The new Battle Back Plate is designed to deliver maximum protection and comfort to players of all ages. 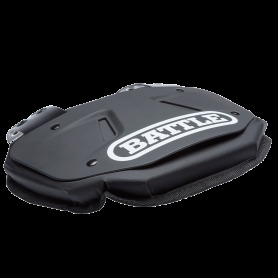 The Battle Back Plate absorbs impact and provides reliable protection to your back region. 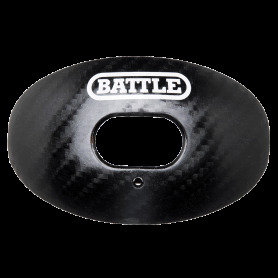 Compared to flat football back plates, the unique design of Battle’s curved plate disperses impact and is much more comfortable to wear. Strong attachment straps keep the back plate close to your back. Floppy back plates won't protect you from painful blindside hits. Get your game right. There is no substitute. The Oxygen Carbon Chrome is the original patented football mouthguard designed and developed by athletic, dental and medical experts to deliver superior airflow and better performance. Available with convertible strap. No boiling required, boiling is a thing of the past - this is the new standard in comfort, protection and performance. There is no substitute. 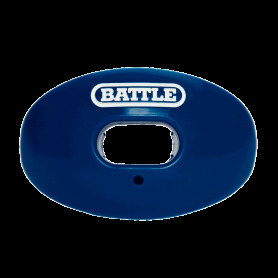 The Oxygen convertible strap football mouthguard is the original patented mouthpiece designed and developed by athletic, dental and medical experts to deliver superior airflow and better performance. No boiling required, boiling is a thing of the past - this is the new standard in comfort, protection and performance. Available with convertible strap.